Generally good conservation pointing should be flush with the stone arris's, this provides the best protection against the elements and is more traditional in look, samples below. Traditional pointing was above all functional, it was installed in a manner best suited to its purpose which is keeping water out the wall, until the latter part of the 19th century rubble stonewalls were not considered beautiful or something to show off about, in fact they were virtually always plastered in residential buildings. In modern pointing, samples right, it has become fashionable to emphasize the pointing work itself, by raising the pointing above the stonework, or to emphasize the stonework surrounding it by recessing the pointing. Both of these are completely inappropriate in conservation work, not only visually but practically as they both trap and let more water into the wall, note all the little ledges, ridges, uneven bits, these catch the rain and allowing it to seep into the wall where the rubble interior provides a path to your living room.. Sketch, left shows poor pointing practice, demonstrates how water gets into the joints. On the right, best practice shows how the same joints should be treated so they perform best. Raking out of joints for pointing preparation is another neglected area, typically one rakes back to firm mortar or twice the depth of the joint width, with a minimum of 25mm. Rubble stones are by there nature a random size and shape, likewise the joints between them are even more so. Cleaning out a joint with a chisel or kango will usually result in a V shaped joint, see sketch left, where the depth is achieved in the Centre of the joint. This is because this is the easy part of the process and usually the bit that comes out quicker and due to the shape and hammering action the simplest to get too. Unfortunately this will result in old mortar remaining on either side of the V shaped joint and will make a weak joint. Think of it like those cone shaped ice-lollies, squeeze the narrow base of the lollie and the wide top of the ice, pops out the top, this is exactly what happens in a mortar joint with weathering and the frost freeze action. 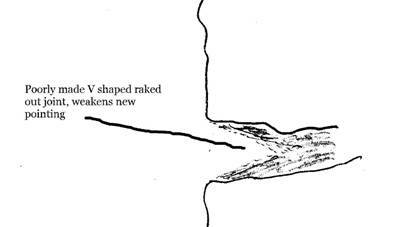 The joint therefore should be squared up, see sketch left, by squaring up we are referring to the removal of mortar NOT the removal of stone with grinders or other tools. The removal of joints should be carried out using specialised tools, such as quirks, plugging chisels and long-necked jointing chisels. These are designed not to bind in the joint and so risk damaging or dislodging adjacent stones if they are soft or vulnerable. Care must be taken not to damage the stonework. The joints should then be brushed to remove loose material and can be flushed out with clean water but avoiding saturation of the wall. Cleaning is quite critical with lime, as dusty joints will prevent the lime from adhering to the stone and old mortar, with cement that would not be so problematic. If you need to remove old, hard cement pointing care must be taken not to damage the stonework. 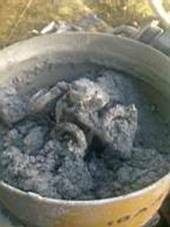 Unfortunately because cement will typically form a tight bond, some damage is inevitably; it would generally be considered better practice to leave cement adhering to the stone surface where it is not affecting the joint, better bits of extra cement than bits of broken stone. Using power tools is often frowned upon by many conservator specialists, but they should not be completely disregarded. 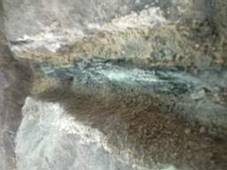 There are some power tools available now which can be used successfully to remove existing mortars (particularly where cementatious), such as those with oscillating blades, small hand held kangos are acceptable in cases where cost is an issue. However, where historic masonry is concerned they should only be used by the most highly experienced craftsperson owing to the ease and speed with which they can damage masonry. It is common practice on a building site to throw the stupid guy up the scaffolding with the kango, its not surprising then how much damage can be done. 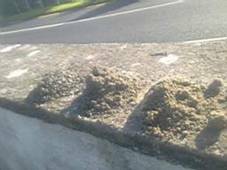 A regular victim of re-point works is the removal of pinning and galleting stones during the raking and cleaning out of the joints. This has both structural and visual implications, as the dominating feature becomes the wide mortar joints with large stones floating around them. Right photo shows pinning stones damaged during joint removals.. The re-pointing process is a special skill requiring experience, training and attention to detail. Works can be done quicker and cheaper but there is no fast alternative to good workmanship and experience. In rubble stonework, mortars tend to be more “aggregatey” than usual, by carefully examining the remains of existing mortar joints, or the mortar below more recent cement mortar one can get a suitable match. Typically a mix of different grades of sands and aggregates are required to get the right mix. Details on the correct mix of sands and lime is covered in other papers, but generally an hydraulic lime and clean sharp sand with appropriate aggregates, soft building sand is not suitable. The strength of the mortar should reflect the strength of the stone or brickwork and the exposure to weathering. Soft stone such as sandstone needs a weaker mix than limestone, a good firmer mortar bed, but not one so hard as to allow cracks and capillary pathways to form, as these would allowing water ingress. 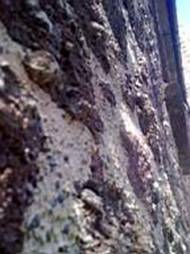 Exposed walls may need a more durable mortar than a sheltered area of a building. 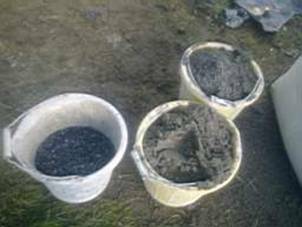 A paddle mixer (left) is the correct method for preparing lime mortars as they will prepare a more useable mortar with far less water than required in a normal barrel mixer, this will assure a more durable and crack free mortar. Mortar should be very thoroughly mixed in accordance with normal lime practice, it should be sticky and not wet or dry, the pointing trowels should be thin enough to allow for mortar to be well pushed into the joints, applying pressure, assists in filling all the voids and forming a good adhesion to the original mortar and the stonework.